Hiking is a great way to get outside, get some fresh air, enjoy your environment and get in some excellent exercise. It’s an easy, inexpensive addition to your workout at the gym. Find a local Conservation Area, National/State Park, or just a trail in your neighborhood. It is wise to be prepared for your hike. Be sure to check your physical condition and limitations with the condition of the trails. Consider factors such as weather, terrain and altitude before you go. Preparation for the trip is very important, the more tough the terrain is; the more training may be required ahead of time with your trainer. Work with your trainer and let them know your plans. They can maybe even suggest some exercises to help warm you up before your hike. Hiking involves a lot of up and down hill and other terrains, each of these can put different strains to your body. Start small then slowly build yourself up to something more challenging. It is important to prepare for your hike so you don’t end up with sore, blistered, tired feet. To start, pick a trail that best suits your own fitness level. Don’t be afraid to start on more level terrain and a short hike. Any type of hike is a benefit to health. 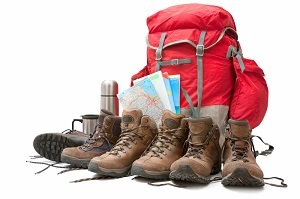 If you plan on hiking over hilly or difficult terrain, make sure you take the right gear with you. Maybe a walking stick, hiking boots, a backpack with snacks will all be required. Whichever distance and terrain you choice, it is important to warm up and stretch before heading out. Eating right is very essential if you want your hike to be a success. Make sure you have a diet that is rich in vitamins, minerals, proteins and all the good stuff your body needs to keep it fit and healthy and to keep you going throughout your hike. Bring some yummy, healthy treats along with you. Experience Nature: The only way to truly experience the outdoors is by walking. It puts you in a hands-on situation and allows you to absorb every nuance of natures’ beauty. You will get to enjoy the sounds, smell and feel of the seasons. Get Great Exercise: Hiking provides the steady exercise that doctors recommend for weight loss and heart issues. Walking or hiking, unlike jogging, will not jar your joints or cause undue stress on your legs and back. Hike to Relax: Hiking allows you to let go of your stresses. Take a deep breath and get away from it all for just a little while. Plan your hiking route, get some friends and family together and go out and enjoy what nature has to offer all while getting a great workout.